The medium form which an original sculpture is shaped has varying degrees of importance in its emergence to final form. For me, this rich desert wood has always had a place of equal. I was first introduced to desert ironwood (Olneya Tesota) through the stylized forms of the Seri Indians of the Sonoran coast of the Gulf of California in the mid 1970's. It is deep-rooted Acacia that produces the lovely purple flowers in the spring. It grows along washes throughout the lower elevation of the Sonoran Desert in Arizona, California, and Northern Mexico. These sculptures are the result of many years of collaborative effort between artisan friends and myself in Sonora. We begin with wood that is long dead and often hundreds of years old. We develop a figure from photographs, models, film and/or direct observation. Next we chalk a form on a log, doing our best to use this valuable wood in an efficient and effective way, chipping it down to a workable shape with a heavy hatchet. Because of its density and homogeneity, it works like stone, resulting in similar techniques, including the use of rotary tools with carbide bits, chisels, files and sandpaper ranging from 60 to 600 grit. My friend, Ramon, has an especially good feeling for movement and character. Ultimately, I bring them to my shop for final detailing and finishing. My appreciation in the miracle of diversity of form in animals has deepened with each year. 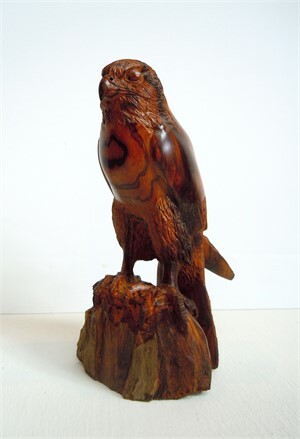 It is my hope that each piece does justice to the wildlife and to this beautiful work. 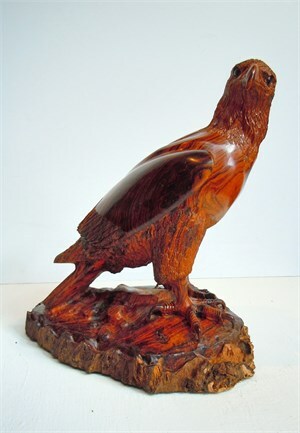 The medium form which an original sculpture is shaped has varying degrees of importance in its emergence to final form. For me, this rich desert wood has always had a place of equal. I was first introduced to desert ironwood (Olneya Tesota) through the stylized forms of the Seri Indians of the Sonoran coast of the Gulf of California in the mid 1970's. It is deep-rooted Acacia that produces the lovely purple flowers in the spring. It grows along washes throughout the lower elevation of the Sonoran Desert in Arizona, California, and Northern Mexico. These sculptures are the result of many years of collaborative effort between artisan friends and myself in Sonora. We begin with wood that is long dead and often hundreds of years old. We develop a figure from photographs, models, film and/or direct observation. Next we chalk a form on a log, doing our best to use this valuable wood in an efficient and effective way, chipping it down to a workable shape with a heavy hatchet. Because of its density and homogeneity, it works like stone, resulting in similar techniques, including the use of rotary tools with carbide bits, chisels, files and sandpaper ranging from 60 to 600 grit. My friend, Ramon, has an especially good feeling for movement and character. Ultimately, I bring them to my shop for final detailing and finishing. My appreciation in the miracle of diversity of form in animals has deepened with each year. 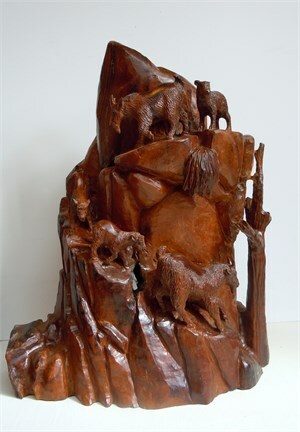 It is my hope that each piece does justice to the wildlife and to this beautiful work.